New York Times columnist Harold McGee used history as his backdrop when kicking off the School of Engineering and Applied Sciences' "Cooking and Science" lecture series. Four years ago, “Science and Cooking” was whipped up by the Harvard School of Engineering and Applied Sciences (SEAS) and the Alícia Foundation in Spain. The wildly popular public lecture series and companion course mix the culinary with the lab. World-class chefs and Harvard faculty illuminate research through experiments with food. McGee dove into the history of science and cooking, starting locally with Woburn-born Sir Benjamin Thompson, Count Rumford (1753-1814), widely considered the founder of kitchen science and the backer of a physics professorship at Harvard. It was a Rumford professor, Eben Norton Horsford, who gave us, in the mid-19th century, the baking powder we find so useful today, McGee added. Until recently, McGee said, scientific focus on cooking was always on safety, hygiene, and industrial manufacturing (such as how to can clams so they don’t spoil). Among his demonstrations, chef Dave Arnold showed how a “Chinese popping machine” was used to puff rice in the early 20th century. Today, the study of gastrophysics draws from psychology, culture, food structuring, and quantum chemistry, among other disciplines. Chef Dave Arnold followed McGee with experiments and a discussion of torching, broiling, heat, and flambé. He peppered his talk with kitchen tips such as, “Almost everything in the kitchen should be [measured] by weight, not volume” (with alcohol being a notable exception). He also demonstrated a “Chinese popping machine” to show how cereal manufacturers puffed rice in the early 20th century. The machine made a loud clang, and had quite a few people in the front rows squirming, as if it were about to blow up. Arnold accidently overheated the contraption, burning the rice, and then used a long metal stick to pry it open. With a startling bang and big puff, plumes of smoke poured out and rose in the hall, setting off fire alarms. There were cheers and hollers of delight, until someone came in and gently reminded the audience the alarms meant they had to evacuate. 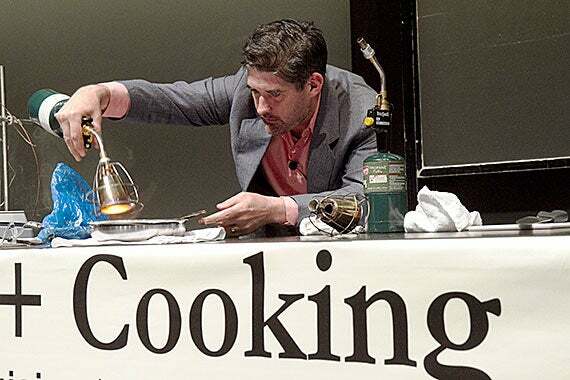 The “Science and Cooking” public lecture series runs through Dec. 9. Click here for more information. Beginning in October, the course will be offered through HarvardX, the University’s online learning initiative. Watch the course trailer here. “Adjusted earnings of male physicians in 1987-1990 exceeded those of female physicians by $33,840 (20 percent). There was no improvement over time in the earnings of female physicians relative to male physicians,” Harvard Professor Amitabh Chandra noted in his study.